In the below section we will see how to add image and text inside the list box control. ImageList control: we will use this control as a data source of images. ListBox control: Inside this control, we will display image and text. DrawItem event of the listbox which we will use to set image into listbox. Drag and drop two controls "List Box" and "Image List". Add images into "Image List" control. Image List control -> Properties -> Images -> Collection. Add images inside this collection and give a name to each added image. Create data table which will fill the list box data source. // Here we add 6 DataRows. Bind the List box with data table. User DrawItemevent of List Box to place an image with text data into Listbox. 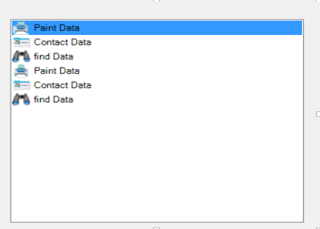 // If data have "paint" then select image "Print"
// If data have "Contact" then select image "Contact"
// imageList1 is the imageList control where we have added three images "Contact", //Search" and "Print"